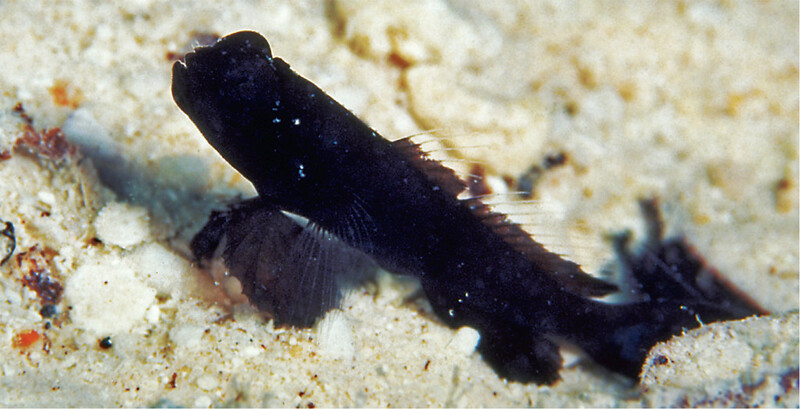 If one were to take a Yellow Watchman Goby and cross it with a Trimma Goby, the result might be something that looks a lot like the Blackdwarf Shrimpgoby (Cryptocentrus nanus). Mature specimens of this newly described species are now the reigning lilliputians of the shrimpgoby world, measuring in at just 17.2–23.4mm in length. This is considerably smaller than anything else previously known in the genus, whose three-dozen species range from relative giants like the Peacock Shrimpgoby (C. pavanoides) at 15cm to the more modestly proportioned Bluespot Shrimpgoby (Cryptocentrus cyanospilotus) at 4.1cm. 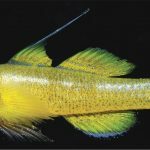 Elsewhere, the Pacific Whitecap Shrimpgoby (Lotilia klauswitzi) comes in a close second at 18.8-27.1mm, and the Adonis Shrimpgoby (Myersina adonis) follows closely at 21.7-30.6mm. Authors David Greenfield and Gerry Allen describe their remarkable little find in the latest edition of JOSF, but the discovery actually dates all the way back to 2002. 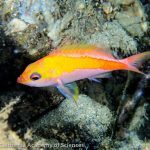 During a survey of Fiji’s coral reef fish fauna, Greenfield found a number of specimens below his research vessel’s anchorage in just 10 meters depth; however, these were initially mistaken to be juveniles of another larger species. 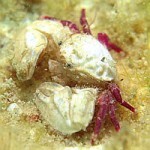 But this identification changed when dissection revealed there to be eggs present in specimens as small 17mm! 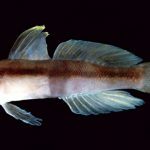 Further morphological analysis showed the presence of several small vomerine teeth, a trait that is noted to be exceedingly rare in Cryptocentrus, reported from just one other species, C. multicinctus. Stonogobiops famously has large, fanglike vomerine teeth—alluded to in the scientific name of the Dracula Shrimpgoby (S. dracula)—but, owing to their distinctive shape, the authors suggest that these evolved independently. Aside from the Fijian specimens, a photograph likely to be C. nanus was taken in Palau at a similar depth and on a similar sandy substrate. 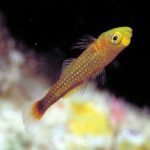 So we can expect that this miniscule goby is probably widespread in either the Central Pacific or West Pacific, having simply been overlooked this whole time due to its strong resemblance to the juveniles of larger species. And there’s still much left to be learned about this exciting new species. For instance, there’s no word yet on which pistol shrimp it’s associated with, nor do we understand where the Blackdwarf Shrimpgoby fits within the evolutionary origins of this highly speciose group. But at least now we know to keep an eye out for it.